MAPLE PLAIN, Minn.--(BUSINESS WIRE)--A more optimistic outlook among millennials about the future of manufacturing could bode well for an industry that is contending with an ongoing skills shortage. 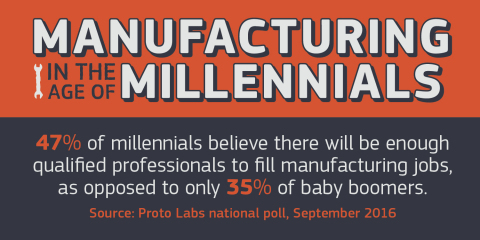 Nearly half of U.S. millennials (47 percent) think there will be enough qualified professionals to fill manufacturing job demands in the next 10 years, according to a survey by digital manufacturer Proto Labs. That’s a marked increase from the only 35 percent of Generation Xers and baby boomers who think the jobs demand will be met. The rosier outlook may be linked to millennials' changing perceptions of manufacturing. According to the survey, 37 percent of millennials see manufacturing as a high-tech career choice – notably higher than both Generation Xers (27 percent) and baby boomers (23 percent). Also, 49 percent of millennials believe engineering is a needed skill in today’s manufacturing sector, compared with only 41 percent of baby boomers. Digital manufacturing has paved the way for a larger breadth of opportunities in addition to the plant floor roles solely and traditionally associated with the industry. Today, top manufacturers must fill a range of skilled positions—from mold techs, to applications engineers, to software developers. The digitalization of the industry has transformed yesterday’s manual nature of manufacturing to the high-tech environment it is today. It is increasingly important for the manufacturing industry to continue shifting its outdated public image, as, in the next decade, it is estimated that 2 million out of the 3.5 million manufacturing jobs will go unfilled due to talent shortages (Deloitte). The financial benefit of a career in manufacturing is another perception that’s changing among young people. According to the survey, 40 percent of millennial respondents think a career in today’s manufacturing industry is high-paying, compared with only 26 percent of Generation Xers. Indeed, the average U.S. manufacturing worker makes more than $70,000 a year, according to the Society of Manufacturing Engineers. The public-opinion online poll was commissioned by Proto Labs and conducted by ORC International’s CARVAN® Geographic Omnibus in September 2016. It consisted of a sample of 1,023 adults comprising 512 men and 511 women, 18 years of age and older. The margin of error is +/- 3.1 percentage points for the full sample.